Most Trusted Telecom Brand Bharat Sanchar Nigam Limited (BSNL) has started Promotional offer on 3G Data Special Tariff Vouchers under 3G Prepaid Mobile Services. 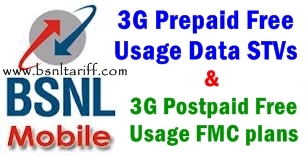 The BSNL Competent Authority of Maharashtra Telecom Circle introduced 3G Data Prepaid Special Tariff Vouchers of Rs.250/-, Rs.450/-, Rs.601/- and Rs.750/- and 3G Data Fixed Monthly Charges (FMC) of Rs.220/-, Rs.400/-, Rs.540/-, and Rs.670/- under Postpaid Services across Maharashtra Circle. Prepaid Special Tariff Voucher of Rs.250/- existing Bundled Free Data usage is 1000MB now Customers on recharge of STV under promotional scheme will get Bundled Free Data Usage 1200MB. Prepaid Special Tariff Voucher of Rs.450/- existing Bundled Free Data usage is 2000MB now Customers on recharge of STV under promotional scheme will get Bundled Free Data Usage 2400MB. Prepaid Special Tariff Voucher of Rs.601/- existing Bundled Free Data usage is 3000MB now Customers on recharge of STV under promotional scheme will get Bundled Free Data Usage 3600MB. Prepaid Special Tariff Voucher of Rs.750/- existing Bundled Free Data usage is 5000MB now Customers on recharge of STV under promotional scheme will get Bundled Free Data Usage 6000MB. Postpaid Fixed Monthly Charges (FMC) of Rs.220/- existing Bundled Free Data usage is 1000MB now Customers on subscribing to promotional scheme will get Bundled Free Data Usage 1200MB. Postpaid Fixed Monthly Charges (FMC) of Rs.400/- existing Bundled Free Data usage is 2000MB now Customers on subscribing to promotional scheme will get Bundled Free Data Usage 2400MB. Postpaid Fixed Monthly Charges (FMC) of Rs.540/- existing Bundled Free Data usage is 3000MB now Customers on subscribing to promotional scheme will get Bundled Free Data Usage 3600MB. Postpaid Fixed Monthly Charges (FMC) of Rs.670/- existing Bundled Free Data usage is 5000MB now Customers on subscribing to promotional scheme will get Bundled Free Data Usage 6000MB. The above promotional offer will be implemented and with effect from 08-07-2013 to 05-10-2013 for a period of 90 days.